"Dr. Phelan's strategies have seen a resurgence in the parenting world. Maybe that's why you feel like everywhere you go, you keep overhearing other moms say to their misbehaving children, 'That's one. That's two. That's three.' And then you watch in disbelief as their kid actually stops!" ― PopSugar MomsAre you the parent of a strong-willed child? Is bedtime a nightly battle? 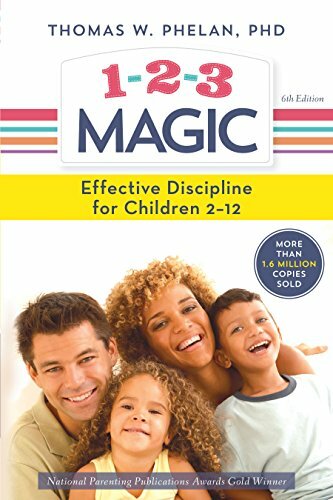 Are you looking to discipline without stress?Since kids don't come with a manual, 1-2-3 Magic is the next best thing. Dr. Thomas Phelan has developed a quick, simple and scientifically proven way to parent that actually works!Using his signature 1-2-3 counting method, Dr. Phelan helps parents to curb obnoxious behaviors like tantrums and meltdowns, whining and pouting, talking back, sibling rivalry and more in toddlers, preschoolers and middle schoolers. He guides parents through drama-free discipline methods that include handling time outs in public, the appropriate length of a time out, and what to do if your child resists the time out.Dr. Phelan also covers how to establish positive routines around bedtime, dinnertime, homework and getting up and out in the morning, and tips for strengthening your relationship with your kids.For decades, millions of parents from all over the world have used the award-winning 1-2-3 Magic technique to raise happier families and put the fun back into parenting. 1-2-3 Magic is one of Healthline's Best Parenting Books of 2017, a 2016 Mom's Choice Award Winner, a 2016 National Parenting Product Award Winner and a 2016 Family Choice Award Winner.